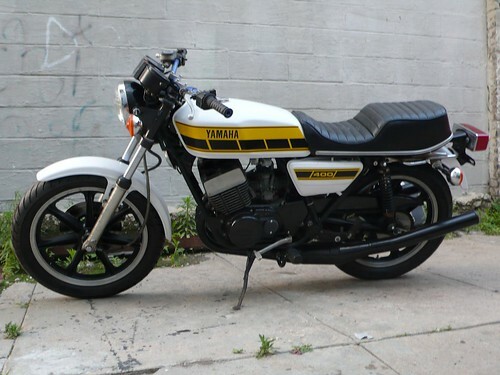 i snatched this up off of the new haven craigslist for this year's Mad Max Strafing Run. the previous owner is a 2-stroke dirt-bike dude who rebuilt it over two years, the good: runs well and goes like the perverbial raped-ape. numbers match, barrels honed at standard bore, front brake rebuilt, new wiseco piston & rings, new avon road runners, aftermarket seat & expansion chambers, owner threw in a jug of yamalube 2T oil and a new pair of napoleon bar-end mirrors. the bad: purple handlebar from a suzuki DR, shift lever from a kawasaki KX, leaks a bit of oil from the left side (oil pump seal? ), might fail inspection in that the signals only work when the engine is running and the stock horn is barely audible. will add some more info soon.